The tree of Ashok, Ashoka tree is of the same height as a mango tree. Ashoka tree has two types. First one is the original, genuine Ashoka tree and the second one is similar but fake or duplicate Ashoka tree. Ayurveda vaidyas use the husk of Ashoka tree for the treatment of some women's diseases, most notably menorrhagia and leucorrhoea. Here we are listing complete Ayurveda views, analysis, introduction and medicinal uses of Ashoka tree in detail. Characteristics, properties and qualities of Ashoka tree – Ashoka tree is cool, sour, receptor, styptic, acrid, astringent and pungent in nature. It pacifies the Tridoshas and is the eliminator of indigestion, Intestinal worms and blood disorders. It has features of a stimulant medicine. Its solution eliminates the disorders of uterus or womb and it is the primary Ayurveda remedy for the treatment of menorrhagia. The husk of Ashoka tree is proven useful in the treatment of menorrhagia. Introduction – the original Ashoka tree is called jonecia asoka in Latin. Similar to mango tree, it is a shadow-giving tree. Its leaves are 8-9 inches long and 2-2.5 inch wide. Initially its leaves are copper colored hence it is also called “ Taamrapallavi ”. Its orange colored flowers come in spring, which become red later. Due to the golden-red color of its flowers, it is also called “Hempushpa”. Its fruits come in fall, which are long round shaped, similar to jambolan. They have seeds inside. 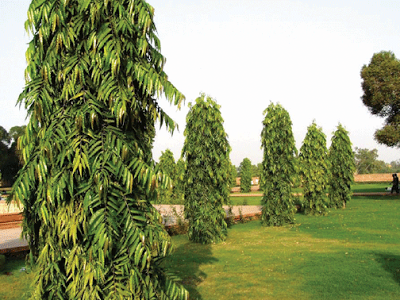 The other duplicate Ashoka tree has the leaves similar to a normal mango tree. Its flowers are whitish yellow and fruits are red in colour. This tree belongs to the deodar family whose height is more but shadow is less. This tree does not possess any property that can be useful in the treatment of uterus related diseases. This tree should not be used as a remedy because there would be no health benefits and the user will doubt the utility and qualities of the original Ashoka tree. Original Ashoka tree is identified with the size of its leaves and the colour of its flowers and fruits. The husk of Ashoka tree is used as a herbal remedy for the diseases of women because only its husk is useful for the women's diseases. Not only Ayurvedic Vaidyas , but also the researchers of modern medical science have tested it in clinical trials and they have found that the husk of Ashoka tree contains hematoxylin, tannin, Catechol, catastral, glycoside, saponin, carbonic calcium and chemical compounds of iron but does not contain alkalides or essential oils. Due to the presence of tannin acid, its husk is hard receptor hence it has control over the excess bleeding seen in menorrhagia. Well-known Ayurveda text Bhaishajya Ratnavali has praised Ashokarishta by saying – Ashokarishta eliminates the menstrual disorder Metrorrhagia, fever, raktapitta , bloody piles, dyspepsia ( mandagni) , aruchi , prameha and shotha etc. Qualities and uses of Ashokarishta – in Ayurveda, Ashokarishta is recognised as the most effective and useful remedy for the women's health problems related to menstrual disorders. Ashokarishta is used in the treatment of leucorrhoea, menorrhagia, dysmenorrhoea, prolapse of uterus, ovaritis, hysteria, infertility and other diseases such as anaemia, fever, haemoptysis and hematemesis, piles, dyspepsia and swelling. Ashokarishta provides strength and power to womb, or uterus and does a great job in the treatment of Polymenorrhea. It also treats the defects of fallopian tubes and disorders of cervix uteri. Quantity and dosage of Ashokarishta – put two spoonfuls of Ashokarishta in a 1/4 th cup of water and take two times in a day after the meals.